Payton’s quote offers a lot of potential for nitpicking interpretations, and that’s even before you consider whether he has any incentive to tell the truth. But the belief that motivates the quote I think is easy to agree on. Payton must believe that it would be counterproductive to simply give all of Ingram’s previous workload to Kamara — even though Kamara would be the team’s best option to maximize yardage on any given attempt — because the added volume would lead to injury and hurt the team in the long run. In general, that inferred belief is true and would be true for any player. 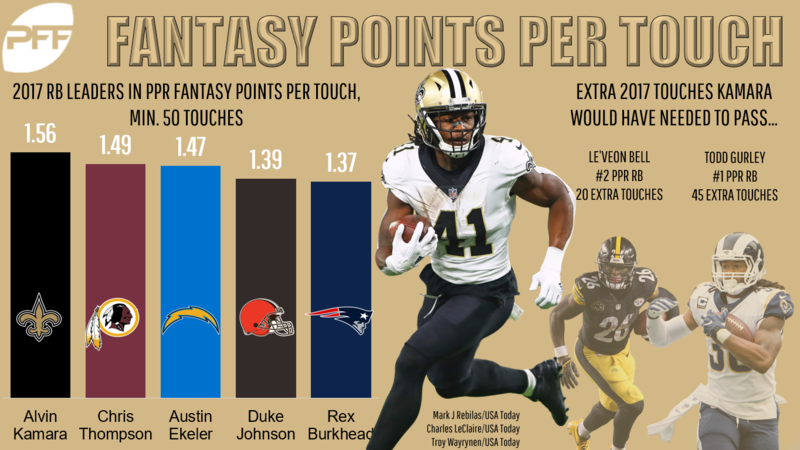 But recent precedent suggests that Kamara is fully capable of handling an increase in his workload and should expect more touches with and without Ingram’s presence. The pitfall in dissenters’ reasoning stems from many teams’ move to use specialized players for specific roles. For example, Tarik Cohen of the Bears and Chris Thompson of the Redskins are both shy of 195 pounds, and their teams tend to limit their touches and limit them to the obvious passing downs that best take advantage of their skill sets. But just because the Bears and Redskins have receiving backs who are likely too small to see a dramatic increase in their workloads does not mean that every back who catches passes is incapable of taking additional touches. 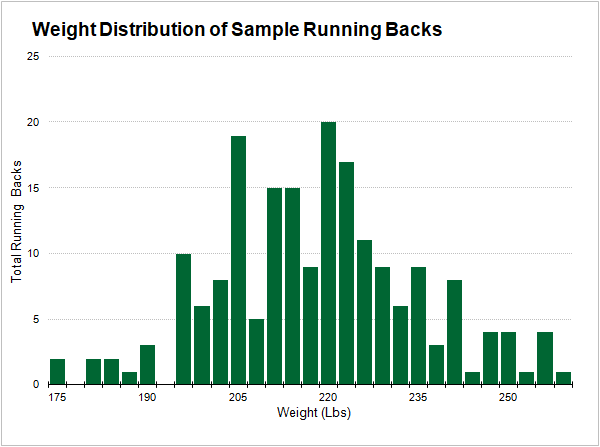 Kamara weighs 215 pounds, and while that falls short of many of the heaviest-volume runners like Ezekiel Elliott (228 pounds), Todd Gurley (228), and Le’Veon Bell (225), it falls right around the median of modern backs. More importantly, if there is a critical threshold of weight needed to survive heavier NFL workloads, it pretty clearly falls below 215 pounds. To prove that point, I created a grid that shows the percentage of games running backs reached or exceeded various thresholds of touches split by six different weight ranges. While smaller backs like Cohen and Thompson only reach 13 carries in a quarter of their games, every class of back north of 195 pounds hits 13 carries in at least half of their games. Backs between 195 and 214 pounds fall a bit short in workload of the optimal weight range between 215 and 234 pounds, but the decline is much less severe than that between them and the sub-195-pound backs. 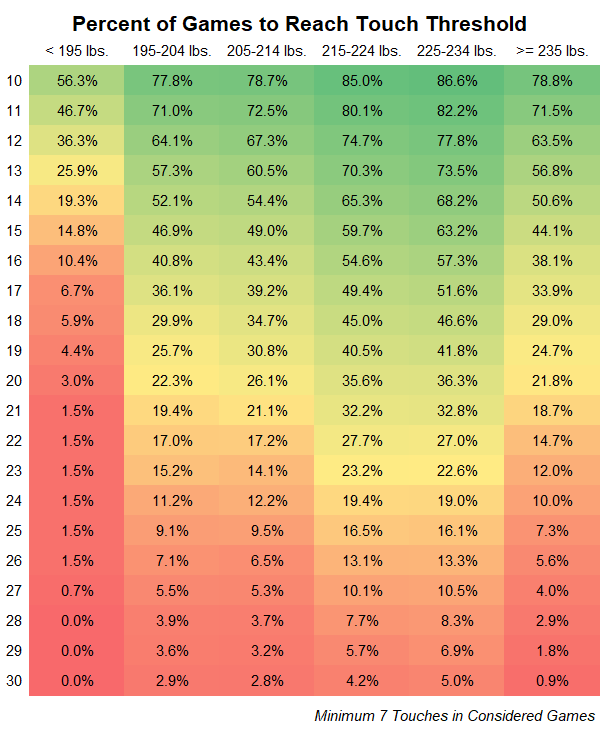 Kamara is on the low end of the optimal weight range, and he’s right there with backs like Kareem Hunt, Melvin Gordon, and LeSean McCoy, who made it through 300-touch seasons in 2017. The Saints won’t need to stress Kamara to that extent because they have multiple effective backs, or will when Ingram returns from his suspension. But as good as Ingram is, he’s not as good as Kamara — Kamara added 43 yards per 100 carries and 41 yards per 100 catchable targets last year, where Ingram added 37 and -9 — and that should provide the impetus for the Saints to move the equilibrium of touches more toward Kamara given that he also clears the weight threshold for a heavier volume of touches. Last season, Kamara averaged 12.6 touches per game. Bump that to 13.8 touches per game at the same per-touch efficiency and Kamara would have passed Bell for the No. 2 spot in PPR scoring. Bump it to 15.4 touches per game and he would have passed Gurley for the No. 1 spot. Kamara’s efficiency may regress, but that workload is hardly a stretch given that backs in his weight range reach that touch volume in half to two thirds of their games. Over a full season, 15.4 touches per game would not even add to 250 total touches. The NFL is suddenly flush with young running back talent, and I don’t have conviction that Kamara will be better than Bell, Gurley, Elliott, or Hunt this season. But I firmly believe Kamara belongs in their tier of expectations. He may not be big, but Kamara is big enough to carry an expanded workload that offers him a chance to be the No. 1 back in fantasy.